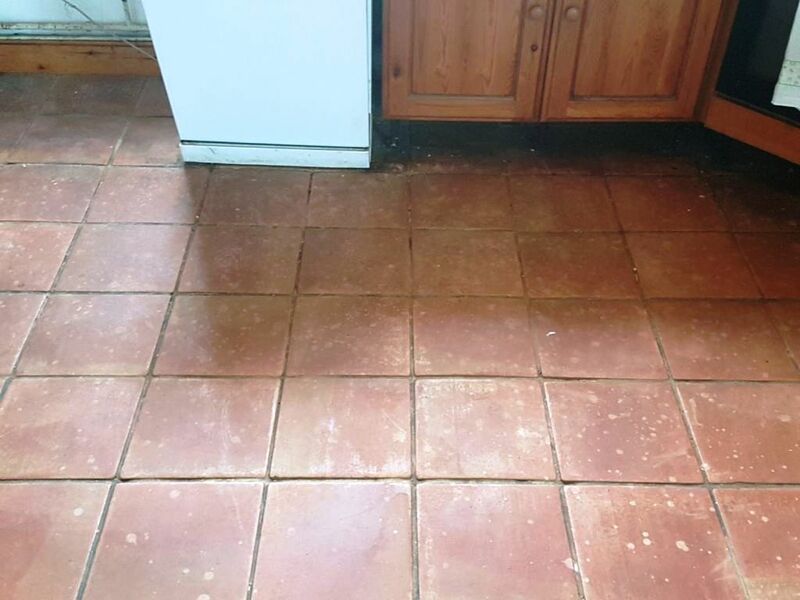 I was recently contacted about the restoration of a fantastic example of a Terracotta tiled floor in the kitchen of a farm cottage just south of Buckingham. There was a very noticeable build-up of dirt on the tiles and in the grout lines. Additionally, there were lots of white spots on the tiles in front of sink area because of a caustic soda spillage. Caustic soda is also known as sodium hydroxide, as is commonly used as a drain unblocking agent. It’s a highly alkaline product and isn’t very friendly to Terracotta. The grout was also stained and naturally, the homeowner was keen to get her floor back into the best shape possible – and I was on hand to see what could be done. Terracotta is a very attractive and useful material that has been in use for over two millennia throughout the world. It has been used perhaps most famously for sculptures and other forms of art, although it has since the days of the Ancient Romans been used as a building material – including in the form of floor tiles. 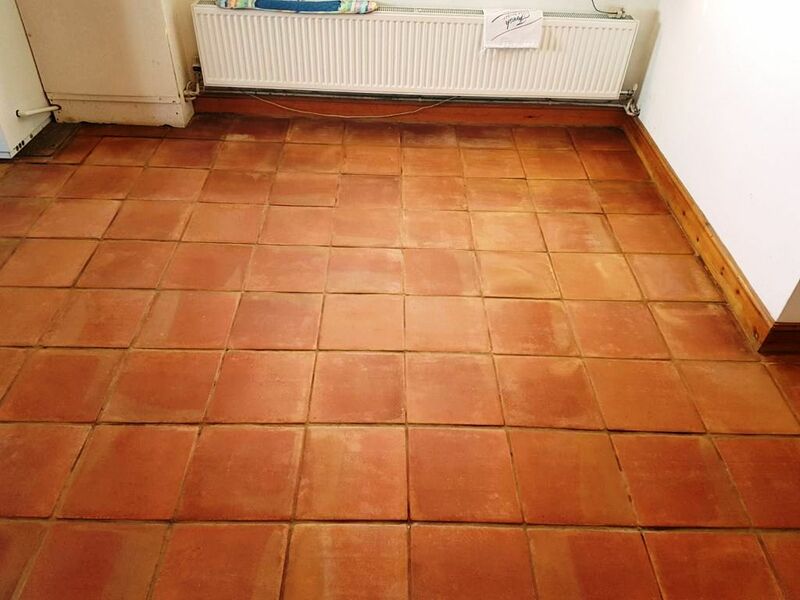 It’s still a popular choice for tiles amongst homeowners today, since Terracotta tiles are typically thicker, and the red colour adds a warm country feel to the home. Before beginning the restoration, I first removed the kickboards from underneath the kitchen units to protect them from splashes from the cleaning products I would be using. Once this had been done, I got straight into deep cleaning the tile and grout lines using a strong dilution of Tile Doctor Pro-Clean which is a strong alkaline cleaner. To get the best result I left the solution to soak into the pores of the tile for approximately ten minutes before being agitated with a black scrubbing pad fitted to a rotary machine. The floor was then rinsed with fresh water and the resulting slurry of soiled cleaning solution was promptly extracted using a wet vacuum. 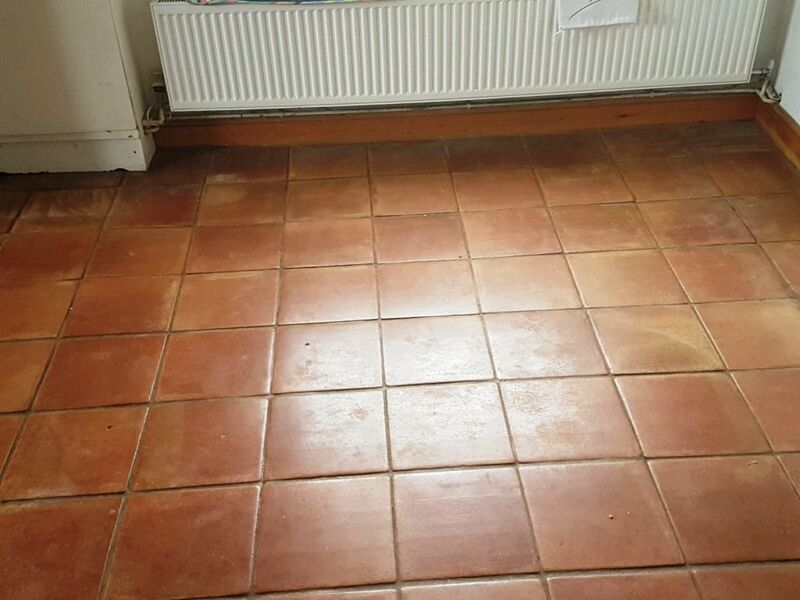 This process left the tiles and grout looking much cleaner and fresher, however, the white spots caused by the caustic soda would need something extra to remove them. I treated these spots using Tile Doctor Acid Gel in combination with a steam machine. Acid Gel is a mixture of phosphoric and hydrochloric acids in gel form, and can be used to neutralise alkali-based stains such as these. We also commonly use it to treat efflorescence (mineral salt deposits). The floor was then once again rinsed with fresh water to remove any trace of cleaning products and neutralise the floor, before being left to dry off fully for two days. I returned after 48 hours and the floor was dry enough to be sealed. 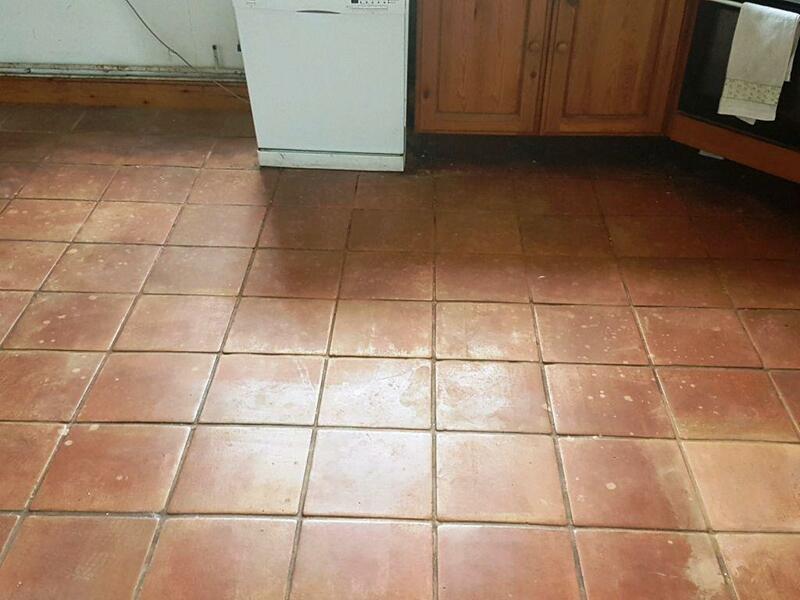 The customer wanted to retain the natural-looking and rustic appearance of the Terracotta, so I suggested that we seal the tiles using Tile Doctor Colour Grow. This sealer is impregnating and colour-intensifying (so it emphasises the patina of the stone), but also leaves a matte finish. The after photos show the result of the restoration – I job well done if I say so myself. And certainly, my customer agreed!